Have you see this stuff? Squishy Baff? I have to say that while bathing in it wasn't appealing, just playing with it was. I mean, it really looks like awesome fun. So how could I make my own? A memory of my niece's disposable diaper exploding at the beach reminded me of the same jelly like substance. Have you ever washed a diaper? If so you know what I mean. 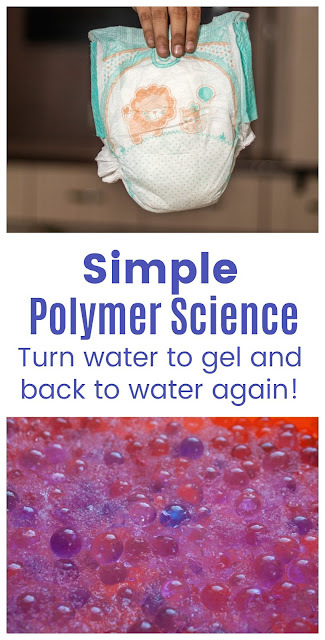 Turns out, this Squishy Baff (or Gelli Baff) is made from Sodium Polyacrylate which happens to be the same stuff they use to make disposable diapers absorbent. Looking further I found the second ingredient was Sodium Chloride; just plain salt. Well, I have a few disposables around, and I certainly have salt, so I wanted to see if I could make my own Squishy Baff. 1. Cut open the diaper. I found it easiest to cut from the outside. 2. Collect the crystals in the container you want your DIY Squishy Baff in. The sparkly parts are the sodium polyacrylate crystals. You will probably have some cotton fluff too, but it can be discarded. 3. Add water, and now you have gel! 4. Want water again? Sprinkle with salt and wait a few minutes. It didn't all go back to water, but most of it did. Maybe I didn't use the right amount, or maybe since the crystals had some of the cottony stuff and the salt had iodine it didn't work completely. Oh well, still cool. So I decided to try it on a larger scale with the water table and some water beads. I harvested crystals from 5 diapers and tried to pick out as much cottony stuff as I could. I added it and water beads to the table along with some water. Sprinkle the crystals on water and you get gel. When we returned the water was pink from some of the water beads bursting because they sucked up so much water out in the heat. The gel was very broken up as well, so I collected what I could and went to harvest more diapers. Once I had my gel, back into the water table it went. Well, first the water table came inside to avoid the 100 degree temperature outside (again)! Before it went back into the table. The girls had fun playing with it for a while, but they really enjoyed it once I gave them shovels and threw in some marbles for them to dig for. The instantly started digging for their treasure! You can see the gel all around the yellow part where the girls dumped it in the column. Once my little guy got up from his nap he joined in the digging fun. Although he was trying to use the shovel as a spoon instead. After getting him to stop trying to eat the gel I decided it was time to turn it back into water. I sprinkled the top with water and waited a few minutes. With salt sprinkled on top. You could see the water oozing out all around the beads. After stirring it most all the gel was liquid again. There was still some where the salt couldn't reach, so I rinsed it all out and added new water. Now Eli could use his shovel to drink much more safely. Which he immediately tried to do. The girls did put some in little bags before turning it back to water, so we can still play with it again. It is definitely cool to watch it turn back into water (see video below), so I am sure we will play with this again. I am thinking the gel they use for flowers may be the same stuff, so I am going to look into that. Diapers were certainly cheaper though!